Think how life would be without needing glasses or contacts. Whether you are nearsighted, farsighted, or have an astigmatism, we have a laser surgery for you. Laser vision correction surgeries works by reshaping the cornea, the dome-shaped transparent tissue at the front of your eye. By reshaping, light can properly focus onto the retina. Without surgery, blurry vision is corrected by bending (refracting) light rays with glasses or contacts. Laser eye surgery is a permanent change that typically achieves 20/25 vision or better. People with mild nearsightedness tend to have the most success. People with a high degree of nearsightedness or farsightedness along with astigmatism have less predictable results or potentially will not be a candidate for surgery. Your doctor will talk with you about which refractive surgical procedure will work best for you. A consultation is needed to determine if you are a good candidate for Laser Vision Correction surgery. We perform a dilated exam and some additional tests, e.g., topography (map of front surface of the eye) and pachymetry (measurement of corneal thickness). Our doctors will be able to evaluate and recommend surgery only if there is minimal risk involved. What is laser vision correction (LASIK)? LASIK (Laser-Assisted in Situ Keratomileusis) is a popular surgery in which an excimer laser is used to reshape the cornea to correct refractive errors. Most individuals who are nearsighted or have astigmatism and many farsighted individuals can obtain corrected vision with LASIK. LASIK offers many advantages. Virtually every patient achieves their desired vision following surgery, with a reduction or elimination in eyeglass or contact lens usage. No bandages or stitches are required, and vision is corrected either that day or the next. Adjustments can potentially be made years later if age changes in vision occur. Rare side effects include seeing glare or halos, night driving difficulty, fluctuating vision, or dry eyes. Side effects typically clear up after awhile. Complications very rarely result. 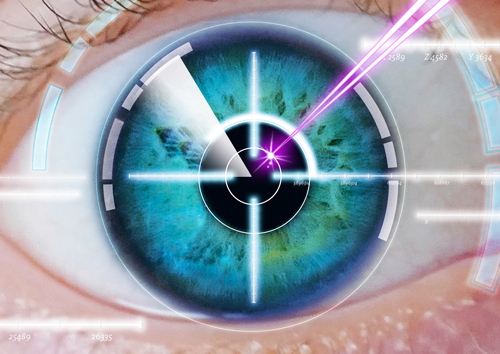 An instrument with an excimer laser is used to alter the curvature of the cornea. The surgeon creates a thin flap in the cornea, the flap is peeled back, and the underlying tissue is reshaped. There are also variations in which no flap is used. With each pulse of the laser beam, a tiny amount of corneal tissue is removed, allowing your surgeon to either flatten or steepen the curve of your cornea, as needed. Numbing drops are used for a painless experience. After the cornea is reshaped, the cornea flap is resituated. The process takes about 10 minutes. VISX CustomVue individualized laser vision correction is a WaveScan®-driven procedure that is more technically advanced. It enables us to create an individualized laser correction completely unique to you. The WaveScan machine is derived from Wavefront Technology, developed by NASA and used in high-powered telescope lenses to reduced distortion and improved visual clarity of images in space. Because the measurements are so refined, the results are crisper, clearer vision vs. conventional LASIK, glasses, or contacts. This procedure also diminishes night vision issues. PRK is the Excimer Laser correction of nearsightedness, astigmatism, and farsightedness which reshapes the front surface of the cornea. PRK differs from LASIK in that is does not require an incision to form a corneal flap. Instead, the top surface or epithelium is removed. To aid in healing and to minimize discomfort, a soft contact lens is placed on the eye for 2-3 days following PRK. Healing time is longer and final best visual acuity takes longer to achieve with PRK as compared to LASIK, but is a fantastic alternative for patients with certain issues such as thin corneas and dry eye syndrome. Heart of America Eye Care doctors can evaluate you for Laser Vision Correction surgery.